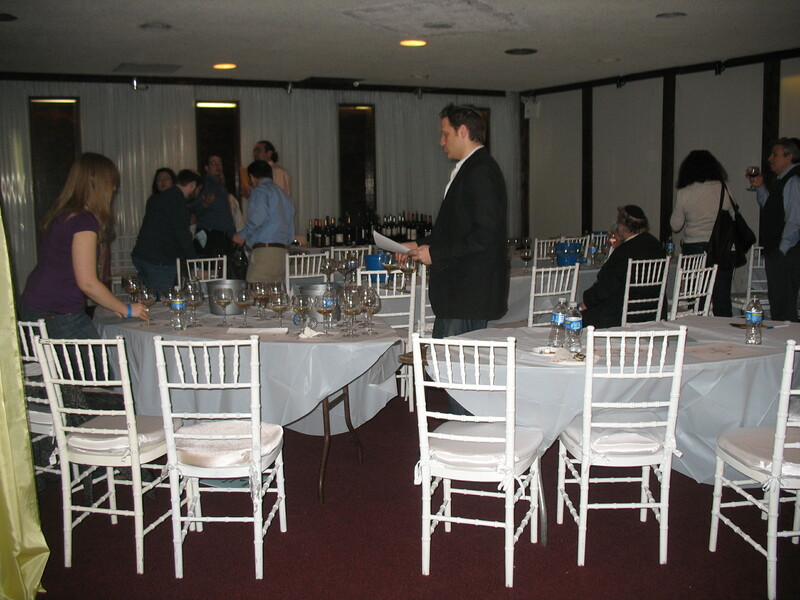 On March 7th, 2010 my friend and I returned to the basement of the Lincoln Square Synagogue, for the Seventh Annual Gotham Kosher Wine Extravaganza. The event is driven by the master in arms, Costas Mouzouras, General Manager of Gotham Wines of Manhattan, NY, and his merry band of helpers. 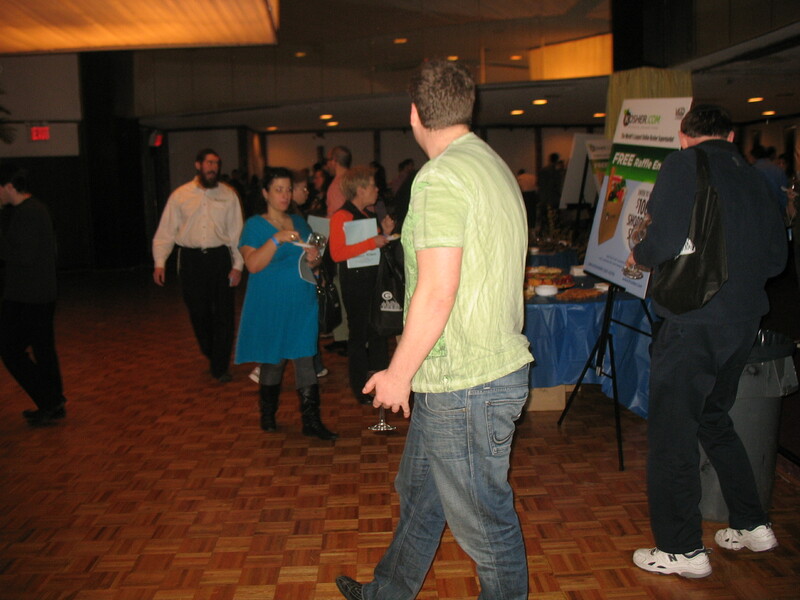 The event was just as busy and successful as the last one we were at in 2009. 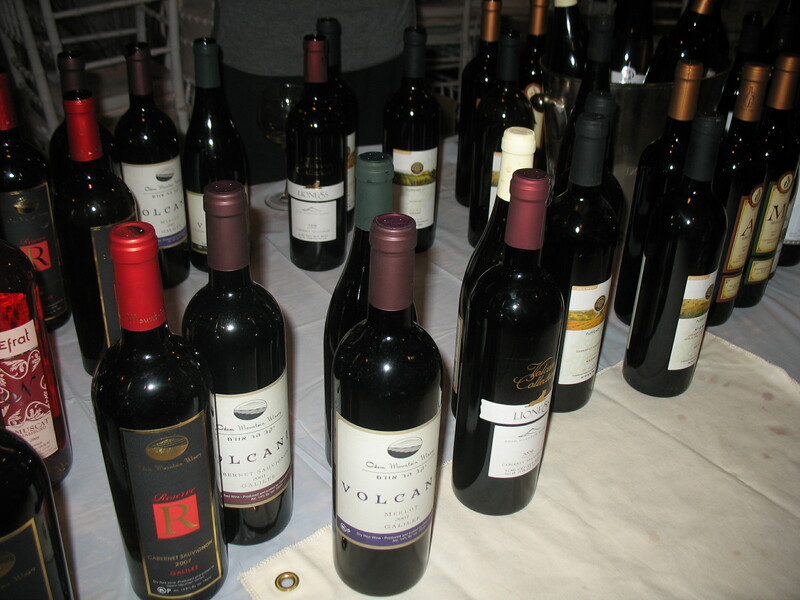 Just like last year, the tables were setup by wine importer rather than by region, because at this event there was more than just one importer. 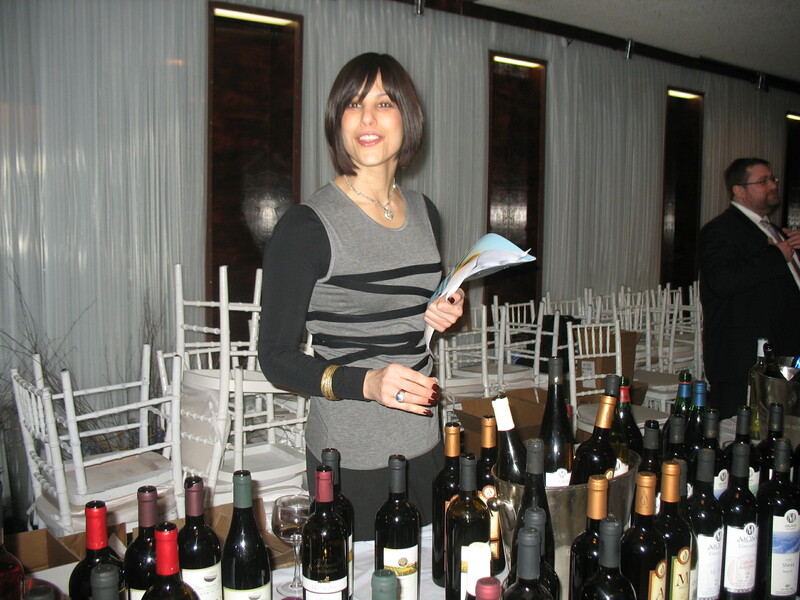 The event is one of those truly rare opportunities where a person is able to taste wines from all around the world, from any importer, and almost any top line kosher wine that exists out there. 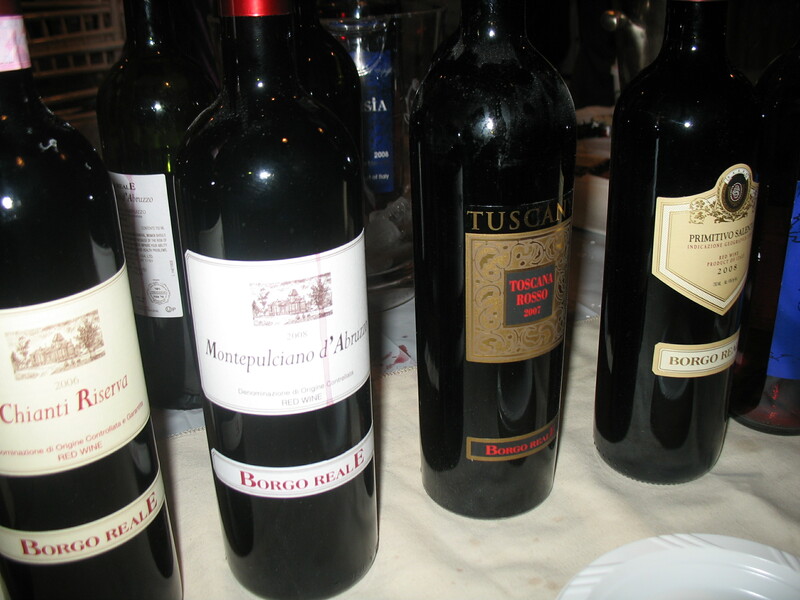 Of course, there was a very large table of wines imported by Royal Wines. 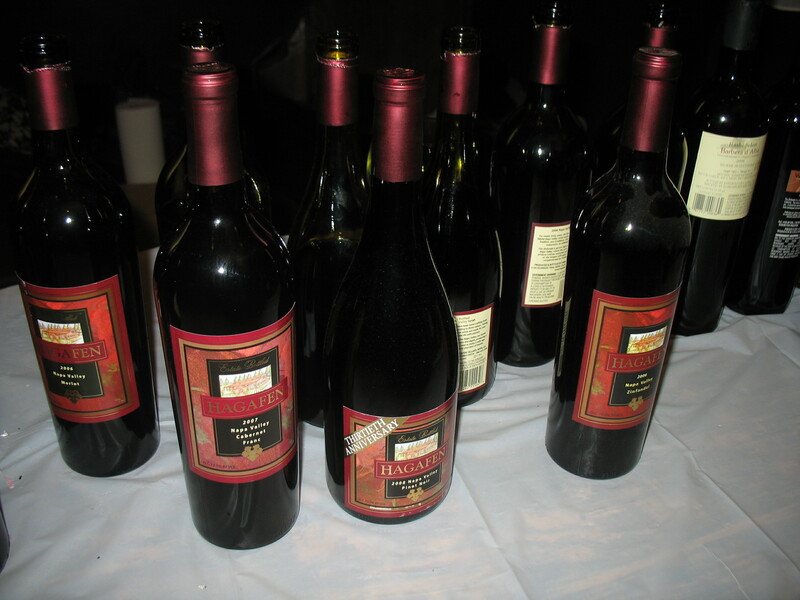 However, there was another 12 tables of wines from all around the world – are you kidding me? It was like being a kid in a candy shop! Where else can you taste up to 400 different wines that are from wineries as varied as Dalton, Yarden (not imported by Royal), Recanati, Tishbi, Abrabanel (now Admiral Imports), Red Fern Winery, Happy Hearts Importer, Victor Wines, and Royal (Carmel, Capcanes, and Yatir Winery). Each of these tables had either the wine maker, wine importer, or wine expert. They were knowledgeable about the wines and as passionate about them as I am about wines. Overall the event was another home run. 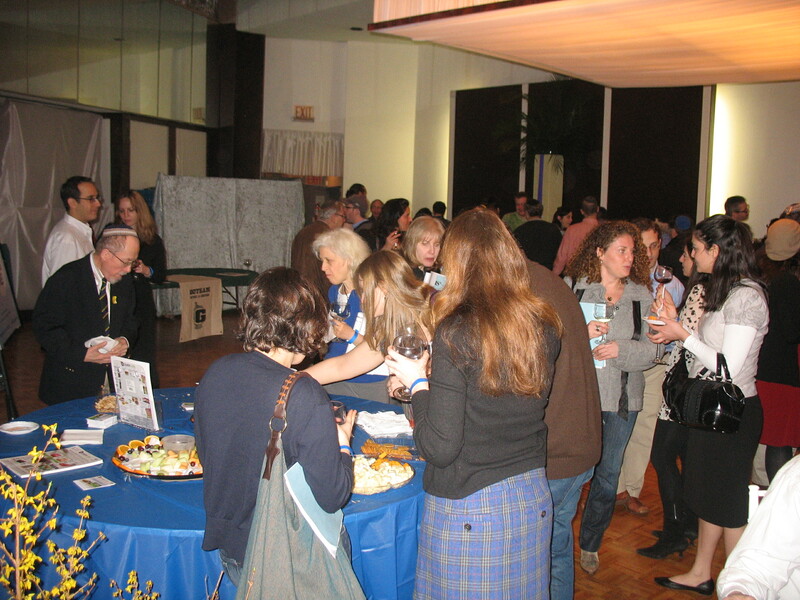 There must have been easily a couple hundred people at the event, all packed into the basement of the Lincoln Square Synagogue (also known as Wink and Stare Synagogue). That said, I never had to wait long to get a glass of wine, and even if one of the people manning the tables was busy talking to a guest about a wine or winery, there was another person happy to pour for others. There was also a fair amount of wine mavens/maniacs, like me, that were a joy to converse with and get tips on what wines were really special or interesting to try, which came in handy when there are 400+ wines to look at/try. Like last year, the event starts off with a special VIP tasting of some superb wines, two at a time. Last year, the VIP session took a bit too long, while this year it was a bit too fast. That said, there must have been some 40 or so seats at the VIP tasting and 2 folks pouring the wine. So that alone took a fair amount of time. Once the wine was poured we had very little time this year to bond or ruminate with or about the wine, as we had 18 bottles, in total, to taste at the VIP session. Many of these bottles were not on the tables or floor, so it was taste it now, or forever hold your peace. I say that, because many of these bottles are way out of my price range. The only times I get to taste them are either at this event or the Herzog event. 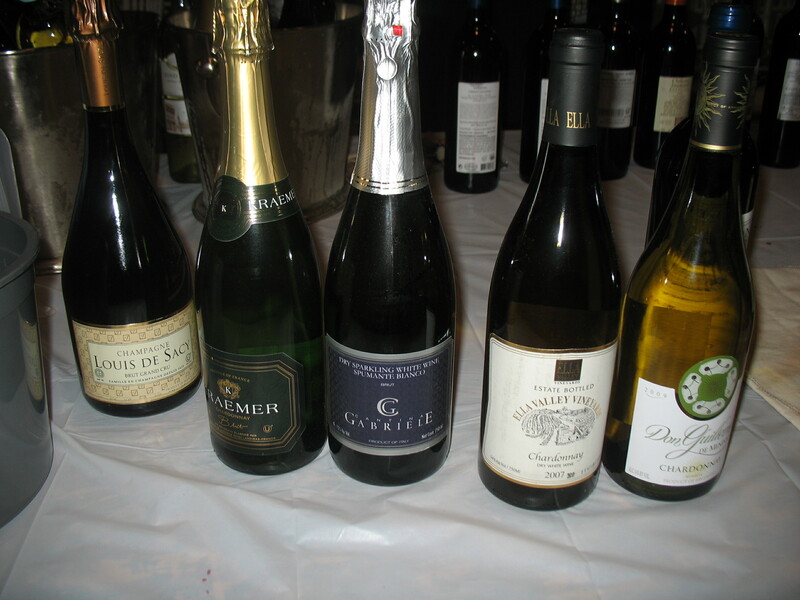 The wines that we tasted in the VIP session are listed below with the rest of the wine notes, in their own section. The wines were tasted two at a time, which allowed Costas to talk about how they differ from each other and/or how they mimic each other. It was an awesome hour and well worth the extra few bucks. With the VIP tasting behind us, we start going from table to table tasting wines. We start with the whites, and once we are done with the pickings, we start back at the first tables going through the reds. There were clear winners in both the VIP tasting and the normal tastings, but a few were top of the line, and those will be the ones with a score of A. 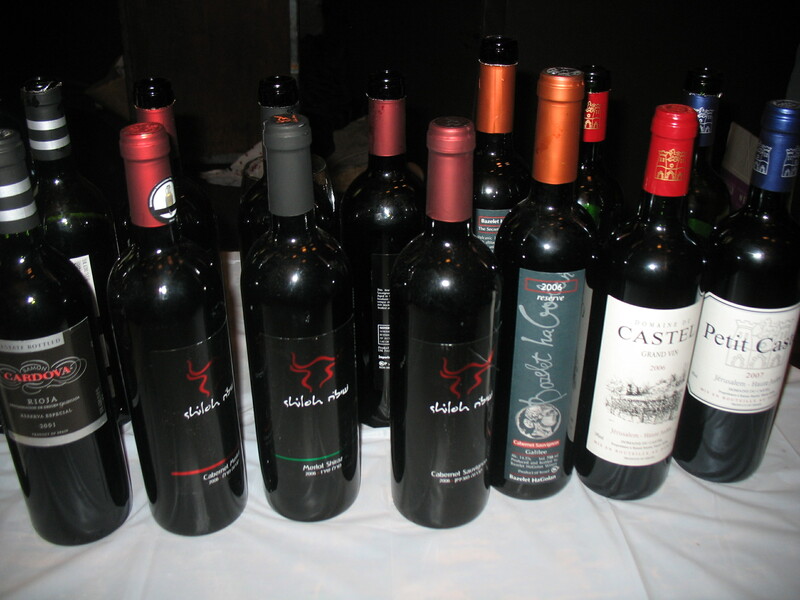 Also, please note that some of the wines were from the Israeli 2008 vintage. You may ask – who cares? Well, it may well be some of the best wine to ever come out of Israel, and clearly a very good vintage, however, it was also shmita. Shmita literally means release in Hebrew, but it also denotes the year in which land in Israel, is meant to be left fallow according to Jewish tradition. Of course that is a bit complicated in the new brave flat world, where fruit can be bought from any climate and part of the world, if people will not sell it locally. To help people survive the new world economy, systems were created both recently and as far back as 2000 years ago. The most prevalent system in use today, in Israel, is called Heter Mechira and many in the Diaspora will not partake of it. The more accepted system is called Oztar Beit Din, where the court system manages the entire set of transactions, thereby validating its correctness and not allowing new plantings. For vineyards it works great, however, both the OU and OK will still not give supervision for wines created in Israel and sold in the Diaspora, using this system. I state all this because the next time you pick up a bottle of 2008 wine from Israel, which is imported to the US by a few companies, the biggest thing missing will be the OU or OK, which is commonly found on all bottles sold in the US. Please check with you local area Rabbi about how you wish to handle the shmita wines that are more and more appearing in your local area wine shops. The simplest way to know is to check the bottle for an OU/OK symbol. If there is none, then it is most probably the 2008 vintage. I state this, because some of the wines we tasted last year were from the 2008 vintage, and I did not even notice at first. 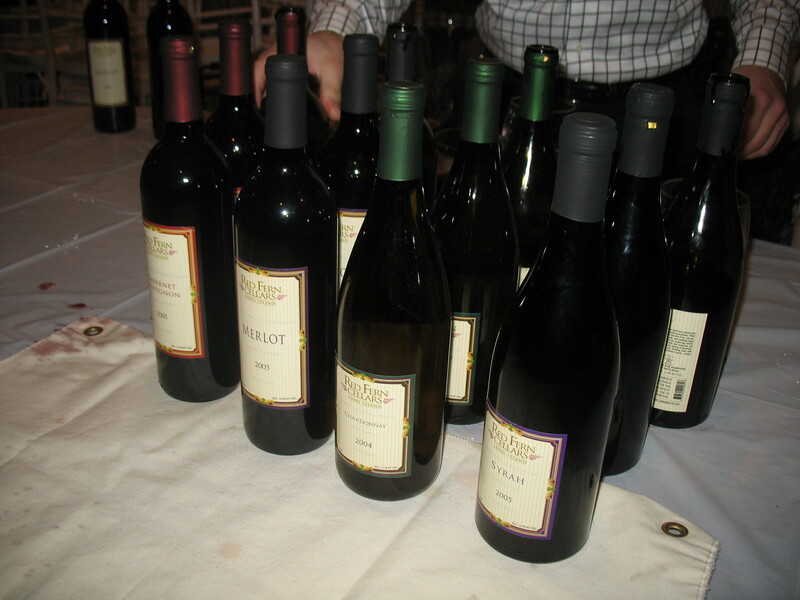 Once I realized it was a 2008 vintage, I was not allowed to spit them out, as wine from the shmita year is not allowed to be wasted in any manner, so I had to swallow, instead of spitting, as I did for all other wines that I tasted that afternoon. Please be more and more conscious as the year progresses. Back on the subject of the VIP tasting for a moment, it was setup with one thing in mind, to allow us to taste a diverse and unique set of new, old, and min-vertical wines in a single hour. As the wines will show, the opportunity was quite unique with Costas hosting the mini event. He was truly in rare form, with quick one liners, notes, and information, all flying at you at 100 miles per hour. Some of the wines we had to taste during the session can be found at no other wine tasting event anywhere in the country – period! Katzrin, Peraj Ha’abib mini-vertical, Carmel Special Edition, Matatia, and many others all at ONE TASTING! I must say that if there were any “bad” parts to the event was that the VIP was a bid rushed, but heck we had 20+ wines to get through. The VIP tasting was off the charts. Costas, as stated previously, was in classic form, and by that I mean – professional, outspoken, passionate, and jovial, and exhausted all at the same time. This kind of event does not just happen by itself; it is huge, and hard to pull off! We came into the room and we had three glasses in front of us to start the VIP session off. This way we had a chance to compare three glasses at once. They smelled a bit like Capcanes to start and I thought they were the Capcanes vertical that I heard we were having, but nope they were Israeli and awesome! Next we had the 2005, 2006, and 2007 Capcanes Peraj Ha’abib, and here there was a bit of a dud. The 2005 was a classical Peraj Ha’abib. The2006 was either sleeping or wrong, but it was far lighter than usual in color and in the nose. The mouth was tannic but boring and not in a Peraj Ha’abib style at all. The 2007 Peraj Ha’abib was tannic and loaded with oak, and we were not in love with them. In Oxnard we had the 2005 and loved it just the same, we had no 2006, while the 2007 was there as well. We loved the 2005 and 2007 in Oxnard, but it must have been opened for longer. In the end, the 2005 and 2007 are nice, though the 2007 is way too young and needs a ton of time. The 2006 did not taste like a Peraj Ha’abib to me. The next three were the 2004 Binyamina Choshen, 1996 Barkan Superieur Cabernet, and 2006 Barkan Superieur. 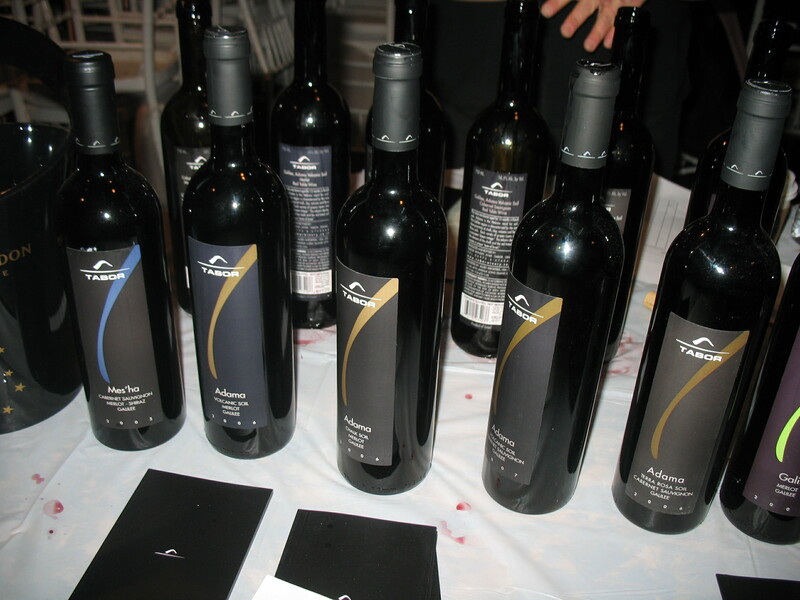 We loved the 2004 Binyamina Choshen and the 2006 Barkan Superieur. The 2006 Barkan Superieur may well be the surprise of the evening to me, fat, huge, muscular, layered and crazy, while the 2004 Binyamina Choshen is crazy fat as well. The 1996 was over the hill and DOA, but still tannic and acidic. It is clear that tannin and acid will keep a wine, but a wine still has a lifespan. 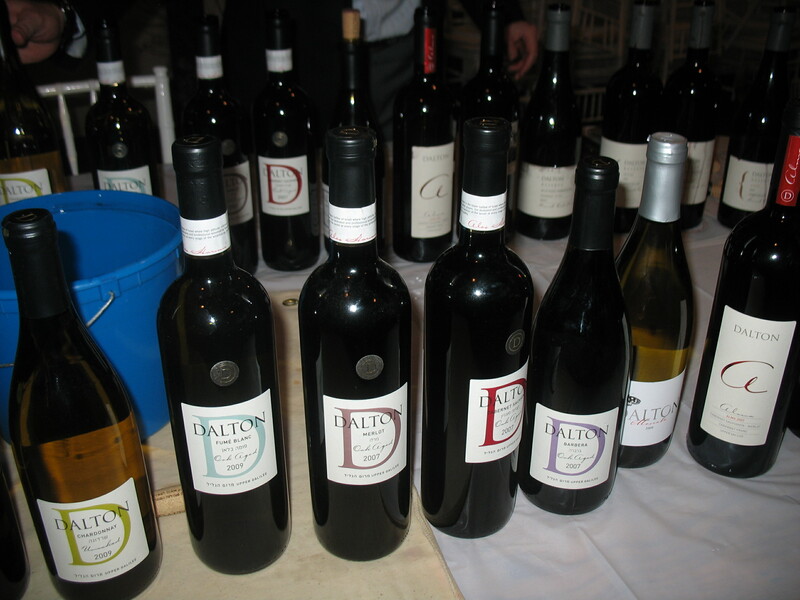 The next three were the 2003, 2004 Yarden Katzrin, along with the famous 2006 Dalton Matatia. Three wines that is priced in the stratosphere, but awesome all the same. 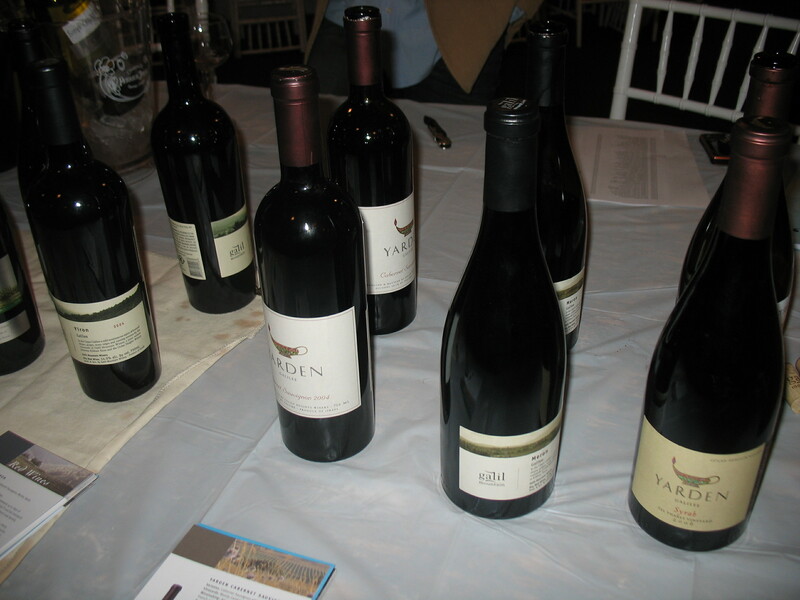 The clear winner was the 2003 Yarden Katzrin, which we had last year as well, and loved equally (gave it an equal score of A to A+), some of the best wine I have tasted in a long time. The Matatia was nice as well, though a bit redder and NOT fat like the other wines. More polished and refined, but not a wine you can ignore. The wine was stately with ripe red and black fruit, spice and nutmeg. The mouth is still tannic and all but layered and somewhat concentrated. The next three were 99 Tishbi Cab, 07 Herzog Clone 6 Cabernet, and 06 To Kalon. I did not get enough To Kalon to get a sense of it any more than when I tasted it in Oxnard. The Tishbi was nice, but clearly on the other side, but not a push over. Still alive and kicking this was FUN! The Clone 6 tasted MUCH better than in Oxnard, which may have been a dumb period. Final three were the Covenant Lavan, 07 Castel C, and a lovely 2001 Guiraud. People were slightly freaked out by the white at the end, but Costas explained it quite well. In the end, the Castel and Lavan tasted the same as we tasted them in Oxnard, a couple of months before. The C is burnt in a cool and nice way, but many thought it was too over burnt with toasted oak. They must have used a crazy toast level. It will turn to nice butterscotch or it will go bitter, only time will tell. The Lavan is one of the best kosher white out there; the Lavan has clear tannins – which are awesome in a white. The rest of the wine is massive. I need to scream a huge shout out to Costas and the rest of the gang, some 12 to 14 strong that made the afternoon an absolute complete joy. 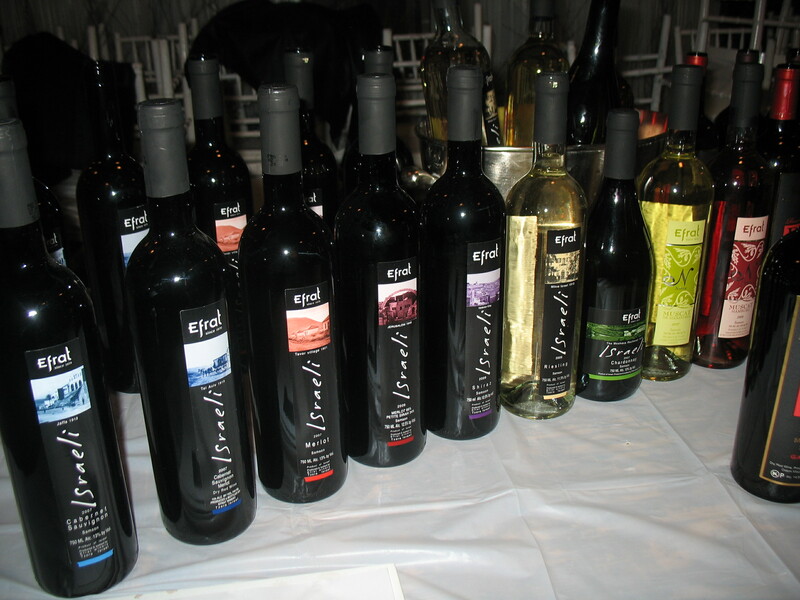 Thank you to Gotham Wines, the Lincoln Square Synagogue, and all the wineries/distributors that were super kind and considerate to share their product with all of us who attended. The nose on this garnet colored wine is filled with plum, cassis, tobacco, sweet oak, chocolate, and vanilla. The mouth on this medium to full bodied wine is rich with raspberry, cassis, plum, and lovely mouth coating tannins. The mid palate is balanced with good acid and soft almost integrated tannin. The finish is long and lovely with plum, cassis, raspberry, sweet oak, tobacco, and soft tannins. The nose on this purple colored wine exploded with plum, cassis, dirt, sweet oak, chocolate, and tobacco. The mouth on this full bodied wine follows the nose with a rich mouthfeel of plum, cassis, slight to integrating tannin, and oak. The mid palate is balanced with acid, oak, chocolate, and dusting tannins. The finish is long with dirt, lovely tannin, sweet oak, plum, cassis, and light hints of tobacco. The nose on this dark purple colored wine was intense and layered with black plum, raspberry, black currant, oak, licorice, and fig. The mouth on this broad shouldered and full bodied wine followed the nose with black plum, cassis, spicy oak, and not yet integrated tannin. The mid palate flows off the mouth with bracing acid, spicy oak, tobacco, and chocolate. The finish is long with still present tannin, chocolate, spicy oak, black plum, and fig. The nose on this black colored wine is exploding with rich black plum, cassis, chocolate, sweet oak, and blueberry. The mouth on this massive full bodied wine is exploding with lovely rich and concentrated fruit, blueberry, layers of cassis, extracted oak flavors, and nice tannin. The mid palate is balanced and flows off the mouth with good acid, sweet oak, integrating tannin, and chocolate. The finish is long and luscious with not yet integrated tannin, black plum, cassis, and chocolate finish. Before I get hate mail, this bottle or vintage must clearly have been in a dumb period, still the color and weight feels off from what I have tasted before. That said, here is what I tasted that afternoon. The nose on this red colored wine was filled with plum, raspberry, oak, hint of chocolate, and spice. The mouth on this medium to full bodied wine was huge and extracted with over the top and almost exaggerated tannin, spicy oak, raspberry, and plum. The mid palate has acid, more oak, crazy tannin, and spice. The finish is long with red fruit, spicy oak, spice, and tannin. The nose on this purple colored wine is exploding with rich black plum, cassis, mocha, sweet oak, and raspberry. The mouth on this full bodied wine is exploding with lovely rich and concentrated fruit, cassis, plum, raspberry, and oak. The mid palate is balanced and flows off the mouth with good acid, oak, tannin, and chocolate. The finish is long and luscious with not yet integrated tannin, black plum, cassis, and chocolate finish. This wine overshadowed its older brother (the 2006) but was much closer to its even older 2005 sibling. The nose on this dark garnet colored wine is filled with cassis, plum, raspberry, oak, licorice, and chocolate. The mouth of this full bodied wine follows the nose with more cassis, plum, chocolate, and sweet oak. The mid palate is mouth coating with acid, chocolate, and tannin. The finish is long and luscious with chocolate, oak, tannin, and smoke. One of the two duds of this lovely VIP session – pass, did not taste, the nose told me to simply move on. The nose on this purple to black colored wine was exploding with oak, cassis, raspberry, licorice, plum, black cherry, and vanilla. The mouth on this muscular and massive full bodied wine starts off with black fruit, oak, cassis, and gripping tannin. The mid palate is balanced with chocolate, coffee, oak, more massive tannin, and acid. The finish is long and extracted with chocolate, black fruit, and vanilla. The nose on this deep purple colored wine is screaming with exuberant jam like aromas of black plum, cassis, blackberry, black fruit, oak, licorice, and chocolate. The mouth on this massive, tannic, and crazy jam packed wine is packed with crazy black fruit, black plum, blackberry, cassis, and raspberry. The mid palate is balanced with sweet oak, and yet more oak, and a nice dollop of tannin on the side. The finish is long with more oak, coffee, dark chocolate, and tannins that keep up nicely with the oak. A truly magnificent wine that shines through almost all other wines we tasted that night. The nose on this massive black colored wine is screaming with black fruit, dark rich blackberry, dark plum, black cherry, rich ripe fruit, cassis, chocolate, and rich oak. The mouth on this massive full bodied wine is rich with ripe black fruit, cassis, black plum, blackberry, and cherry. The mid palate is balanced and flows from the mouth with acid, sweet oak, chocolate, and gripping tannin. The finish is long with rich oak, black fruit, cherry, chocolate, and tobacco. The nose on this black colored wine starts off with cassis, raspberry, licorice, oak, nutmeg, and spice. The mouth on this full bodied wine is inky and deep with rich plum, cassis, raspberry, coffee, and oak. The mid plate flows off the mouth nicely with acid, coffee, spice, and gripping tannin. The finish is long and expressive with plum, chocolate, coffee, and tannin. The nose on this dark brown colored wine with a brown rimmed halo has notes of coffee, chocolate, oak, old cooked plum, and well just dark old wine notes. The mouth on this dead wine was dead and old, with offsetting astringency, plum, and dark chocolate. The acid has kept it somewhat alive, with chocolate from the still alive oak. This wine tasted so much better than it did the last time we tasted it in Oxnard. The nose on this garnet colored wine is screaming with rich black fruit, chocolate, tobacco, raspberry, and rich plum. The mouth on this massive, luscious, structured and still very tannic wine is mouth coating with huge awesome layers of black fruit, raspberry, and chocolate. The mid palate flows harmoniously from the mouth with more mouth coating and rich tannin, and acid. The finish is long with chocolate, tobacco, rich plum, raspberry, and crazy long finish with fruit and tobacco lingering. The nose on this black colored wine is screaming with rich oak, chocolate, black cherry, blackberry, cassis, and rich spice. The mouth on this massive full bodied wine is rich, layered, and mouth coating with tight tannins, chocolate, oak, blackberry, and cassis. The fruit on the mouth is rich and ripe while not being overly ripe to the point of tasting cooked. The mid palate is balanced and flows from the mouth with still bracing tannins, nice acidity, oak, and chocolate. The finish is crazy long with chocolate, rich oak, blackberry, and rich ripe fruit. This is a crazy winner that will be around for at least another 8 years. Wait – I know what is coming – yes we tasted whites after reds, heck after monster reds! Reminded me of a wine tasting I had of French wines, where he did the very same thing. I did not mind, the whites were so extracted in their presence that it almost worked, but I am strange. The nose on this vibrant yellow colored wine is screaming with lychee, green apple, guava, peach, oak, and almonds. The mouth on this full bodied wine is creamy and hopping with butterscotch, apple, peach, and oak. The mid palate is balanced and structured with bracing acidity, spicy oak, oak tannins, and mineral. The finish is long and creamy, with more butterscotch, almonds, oak, peach, and lychee. The nose on this striking gold colored wine is SCREAMING with heavy toasted oak – almost burnt, butter, apple, melon, peach, vanilla, and spice. The mouth on this rich and explosive full bodied wine follows the nose with crazy heavy toast green apple, melon, peach, and lemon. The mid palate is packed with more toasty oak, bracing acid, and spice. The finish is super long and heavily extracted with crème brulee, rich oak, orange peel, apple, and lemon. Definitely, not a wine for everyone, but one that everyone needs to try! It is crazy fun and would love to see what all the burnt oak turns into, some nice butterscotch or maybe some more bitterness. There were some that had real issues with this wine saying it was too overoaked or burnt, time will tell. To be truthful I was overdone with the pace of the wines, so all I have on this wine is that it was awesome. The botrytis was not so overpowering but was clearly in the picture, along with ripe summer fruit, and tad of bitterness at the end. This wine is a power house and one that is going nowhere for a long time. The nose on this straw colored wine was hopping with toast, almond, apple, lemon, and citrus peel. The mouth on this medium bodied wine was mouth filling with tight bubbles, lemon, apple, and cherry. The mid palate is bracing with acid and toast. The finish is long with more mousse of small bubbles, toast, acid, and mineral. The nose on this light gold colored wine is screaming with sweet oak, peach, apricot, toast, and lemon. The mouth on this medium to full bodied wine is rich with sweet oak, crème brulée, toast, lemon, apricot, and peach. The kid palate is bracing with rich acid and almost tannin mouthfeel. The finish is long and luscious with more crème brulée, peach, and sweet oak. This is quite a lovely wine, but please take note of its the shmitta status. The nose on this gold colored wine is hopping with sweet oak, peach, apricot, and apple. The mouth on this medium to full bodied wine is creamy and rich with oak, peach, apricot, and apple. The mid palate is balanced with nice acid that makes the creamy mouth feel not so cloying, almost crisp in a way. The finish is long, creamy, with custard and acidity. The nose on this lemon colored wine is filled with oak, peach, toast, apple, and lemon. The mouth on this medium to full bodied wine is rich with peach, lemon, and apple. The mid palate is balanced with bracing acid and lemon peel. The finish is long and bright, almost tart with lemon and oak. The nose on this dark garnet colored wine is screaming with cassis, blackberry, raspberry, black cherry, oak, and mocha. The mouth on this full bodied wine is rich and opulent with concentrated layers of chocolate, cassis, raspberry, black cherry, and blackberry. The mid palate was balanced with acid, massive tannin, and chocolate. The finish is long with black and red fruit, oak, chocolate, and tobacco. The nose on this dark garnet to purple colored wine is rich with dirt, spice, oak, plum, cranberry, raspberry, and roasted herb. The mouth on this rich and extracted mouth coating full bodied wine, plum, tight and not yet relaxing tannin, cranberry, and raspberry. The mid palate is bracing with more not yet integrated tannin, oak, and coffee. The finish is long and luscious, with tannin, dirt, coffee, all dressed in a long leather coat while smoking on a massive tobacco laden cigar. The nose on this dark garnet to purple colored wine is exploding with rich plum, raspberry, black cherry, sweet oak, white pepper, and smoke. The mouth on this massive full bodied wine is accentuated with smoke, tannin, raspberry, plum, cassis, and mouth coating tannin. The mid palate flows off the mouth with acid, tannin, and lovely coffee. The finish is long and fun with pepper, ripe plum, raspberry, oak, chocolate, and coffee. This is one fun bottle of Syrah that is not going anywhere in the near or distant future. The nose on this dark garnet to purple colored wine is rich with plum, cassis, smoke, chocolate, oak, licorice, and vanilla. The mouth on this full bodied wine follows the nose with plum, cassis, raisins, fig, and massive mouth coating tannin. The mid palate has acid, more tannin, and light hints of chocolate. The finish is long with vanilla, prune, toasty oak, and spice. We first tasted this wine from the barrel in 2008 at the winery. Since then it has moved away from its green vegetable garden days into a more structured and floral wine – which is quite lovely as well. The nose on this garnet to purple colored wine is exploding with raspberry, floral notes, oak, black cherry, licorice, roasted herbs, and dirt. The mouth on this full bodied wine clearly shows its time in oak, but not in an overpowering manner, along with mild tannin, tobacco, raspberry, and oak. The mid palate is balanced with oak, acid, and tannin. The finish is long with oak, tobacco, more mouth coating tannin, sweet cedar oak, spicy notes, chocolate, and light leather. The nose on this garnet to purple colored wine is filled with raspberry, oak, black cherry, licorice, roasted herb, and dirt. The mouth on this full bodied wine is huge with black cherry, plum, mouth coating tannin, and earth. The mid palate is packed with acid, more tannin, and coffee. The finish is long and super spicy with spice, tobacco, plum, and earth. This wine is clearly far better than the 2004 vintage and very different as well. The nose on this dark garnet colored wine is smoky with rich earth loam and mineral notes, along with raspberry, black cherry, cassis, and oak. The mouth on this medium to full bodied wine is soft and coating with lovely integrated tannin, raspberry, cranberry, black cherry, and cassis. The mid palate is balanced with oak, integrated tannin, and coffee. The finish is long and spicy with coffee, raspberry, oak, and more spice. The nose on this dark garnet colored wine starts off hot, then hits you with spice, raspberry, cassis, pepper, plum, and chocolate. The mouth on this medium to full bodied wine has plum, cassis, and rich cedar oak. The mid palate is balanced with nice acid, chocolate, integrated tannin, and nice oak. The finish is long with more cedar oak, cassis, spicy notes, spice, and chocolate. I do not have a lot of notes on this wine other than the wine is purple colored with a rich smoky nose with cassis, and plum. The mouth on this rich and full bodied wine is mouth coating and spicy with spice, rich oak, and cassis. The finish is long in mouth. The nose on this dark ruby colored wine is hopping with spice, violet, strawberry, crushed herbs, oak, and kirsch cherry. The mouth on this medium bodied wine is soft with soft tannin, cherry, raspberry, and light oak. The mid palate is acidic with oak, dirt, and spice. The finish is long with integrated tannins, acid, coffee, and raspberry. The nose on this ruby colored wine is spicy with prune, plum, oak, spice, and crushed herbs. The mouth on this medium bodied semi sweet wine is heavy with tannin, raspberry, and black plum. The mid palate is balanced with oak, tannin, and spice. The finish is medium with a bit too much sweetness that is not integrated with the wine’s structure. The nose on this light garnet colored wine is filled with dark black cherry, rich plum, spice, pepper, and spice. The mouth on this full bodied wine rich and extracted with rich tannin, rich plum, and cassis. The mid palate is balanced and extracted with rich oak, tannin, and black fruit. The finish is long and spicy with more rich extraction, oak, tannin, spice, pepper, tar, and rich black fruit. The nose on this dark purple to black colored wine explodes with rich oak, cassis, rich ripe plum, spice, black pepper, and tobacco. The mouth on this full bodied wine is rich, mouth coating, and full in the mouth with dark chocolate, ripe plum, and cassis. The mouth is rich and ripe that is concentrated and layered. The mid palate is balanced with acid, rich oak, and chocolate. The finish is crazy long, spicy, with a soft and spicy mouth, filled with tannin, mounds of chocolate, rich plum, and fig. 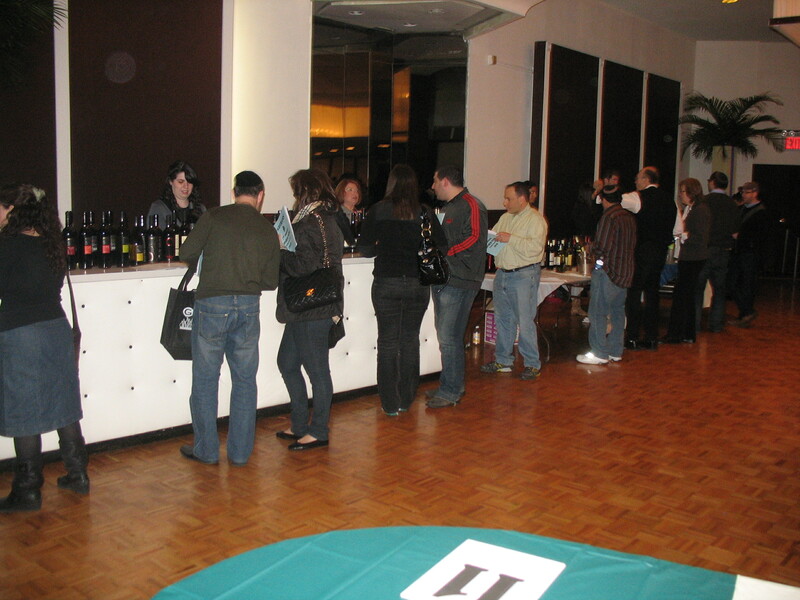 Posted on January 16, 2011, in Kosher Red Wine, Kosher Rose Wine, Kosher White Wine, Wine, Wine Tasting and tagged Gotham Kosher Wine Extravaganza, Gotham Wines, Kosher Wine Extravaganza. Bookmark the permalink. 1 Comment.